"Paradise Found" is owned by Bob and Mary Hall from Nowra, NSW..
1981 IBC Coach with a rear mounted 10.4 ltr 3208 Cat V8 and 5 speed Allison Transmission. This vehicle was set up for 2 people although we have seats for 4. The spare seats are swivel mounted and seat belted and become our armchairs when watching TV or working in the study. Moving further back we have a lounge then a full kitchen with gas stove and cooktop, 220 ltr 2 door fridge that works on DC power. Next we have a shower and separate toilet, an automatic front loading washing machine and laundry tub. At the rear we have 2 wardrobes and a Double size bed with storage under and behind. Cooling/heating is provided by 2 x RC Aircoditioning units and heating is a by a 2 Kw Diesel heater. Hot water comes from a Continuous Gas HWS. Under the bus we have plenty of space in storage bins although they always seem full. Fuel consumption averaged about 33 ltr/100km for the last 25,000 km. Behind the bus we pull a trailer that carries our new (2017) Kia Picanto and where the boat used to go on top we now carry a 2 man Kayak as the boat was too hard to get down and never got used. We were Married in 2006 and Mary retired then, Bob had to wait until mid 2007 before Telstra gave him a heap of money not to come to work any more so at age 54 he retired also. 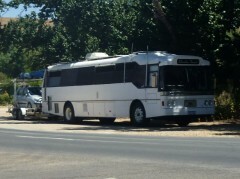 We purchased the bus in Aug 2007 in a liveable state and have been adding and tinkering with it since. In early 2009 we got all our Medical and Dental issues resolved, sold the contents of our house, acquired an Agent and tennants and in June 2009 we hit the road and took nearly 2 years to complete the first circumnavigation. We have done quite a bit of voluntary work around the country and have enjoyed ever day of it. 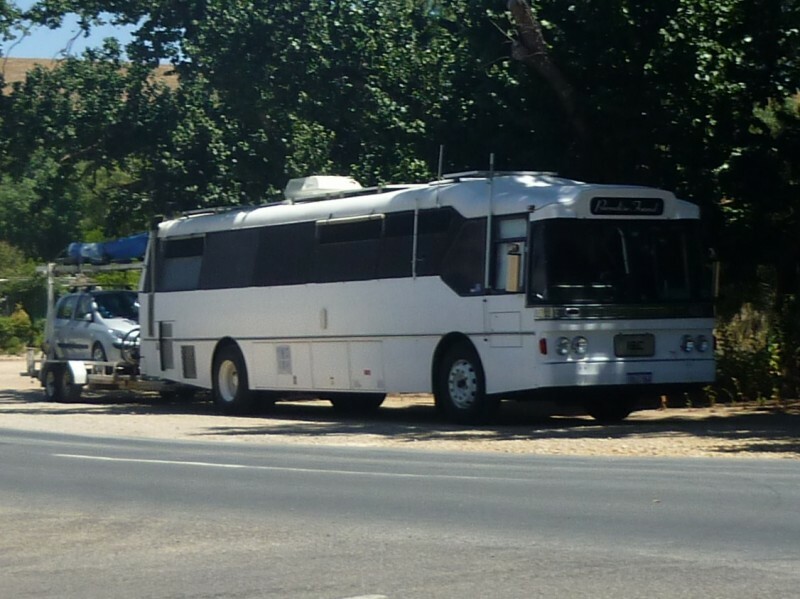 We so enjoy living in our bus that in places where we have been offered in-house accomodation or cabins we have refused because we are so comfortable. We also travel with our 12 year old Chihuahua, Sasha who is a great travelling companion. Our little dog died on our second trip to Darwin in 2014. We have continued to travel and have just completed 8 years on the road. We have children in Adelaide and the NSW South Coast so we have worn a bit of a track between the two but what we enjoy now is Caretaking on sheep/cattle stations. We mostly work in the Cunnamulla area of SW Queensland and got our first job through Outback Links. Most of our jobs now are from word of mouth. There is a lot of need out there.